Every day this week, we will be outside the Naropa Cafe from 11 to 3, talking to Naropans about the Jack & Gin party and selling raffle tickets. Stop by and see us. We’ll have books for sale. In case you haven’t gotten the last two issues, be sure to pick them up before they’re gone! Plus, they’re at discounted prices for students. We’re still talking with local Boulder businesses about donating items for our raffle. Dear and most lovely readers, if you’re a Boulder business owner and would like to support local growth via donations to Bombay Gin, please email me: hngoodrich@gmail.com. Or if you’re out of town (or state or country) and would like to donate, don’t hesitate to email. And, last but not least, we’re proofreading all content this week. In addition to the authors mentioned in previous previous posts, we’re also featuring work from: Dodie Bellamy, Ronaldo V. Wilson, Erin Morrill, Christina Mengert, Lara Durback and more! This issue is going to be phenomenal. We cannot wait for it to come out. Also, I want to wish Ariella Ruth, a former editor extraordinaire, a wonderful and very happy birthday! 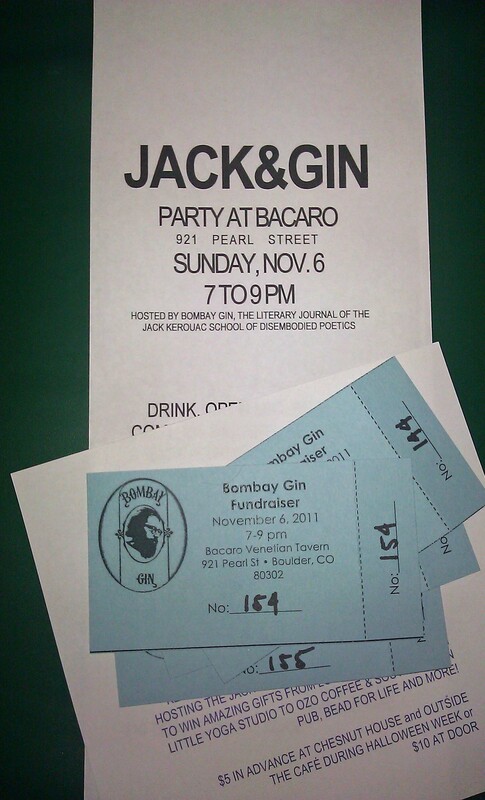 Exciting news…we’re throwing a Jack & Gin party at Bacaro, Nov. 6 from 7 to 9 pm! Join us for an evening to celebrate Jack Kerouac and Bombay Gin. There will be an open mic, music, lovely company and, of course, drinks. Support Bombay Gin -- get raffle tickets while you can! The Jack & Gin party is our fall fundraiser, for which we’ve received donations from Boulder businesses: The Yoga Pod, Southern Sun Pub, Bead for Life, Ozo Coffee and many more! Donations range from $75 to $25 in gifts and gift certificates. Other donations include: signed broadsides from the Kerouac school, Anne Waldman’s new 720-page-book “The Iovis Trilogy”, signed copies of books by Michelle Naka Pierce, and more. How do you score these amazing gifts? Buy raffle tickets. As many as your heart desires. $5 in advance or $10 at the door. Chesnut House on the Arapahoe Campus. See the lovely Diana in the front office. Ask any of the Bombay Gin editors for one, two or more tickets. For all of you out-of-towners interested in donating, please email me (Heather Goodrich) at hngoodrich@gmail.com and we can talk donations. And, if you can’t buy tickets, no sweat. We still want you to come. Bring friends, work to read or just yourself. What better way is there to support Bombay Gin and Jack Kerouac than sippin’ jack & gin? Issue 38.1 of Bombay Gin is featuring companion pieces from writers as a publishing expression of threshold; our theme. Interviews, creative work, prints, lectures, essays, and more will be lining the pages as contiguous points of entry. I, in turn, thought it would be fun to play hostess on this blog and pose questions between the writers that will be read between our lovely Bombay Gin pages. Vanessa Place & Colin Frazer: if Helvetica is the font of the mass message—the public space—what is the font of anonymous publication: what does anonymous look like in serifs and scripts? Lily Hoang & Vanessa Place: pronouns as possession, permission, and binary—how do you flip your pronouns in writing without installing another duality? In Evolutionary Revolution our values, our history, is rewritten—or perhaps, first written in this turn—Vanessa as publisher and Lily as writer, is this a template for discourse remediation in the world? What thresholds are crossed in breaking glass, water, word, and light? Lily Hoang & Thurston Moore: you say you want a revolution: in what compositional units would you measure writing’s evolution: notes, words, scales, breaths, shes, sentences, frets, paragraphs, lines, breaks, codas, space, story, chapter, track, kindle, disc, paper, room? What thresholds do you cross when entering the page? Bhanu Kapil & Thurston Moore: what is the sound of schizophrene? Bhanu Kapil & Kirsten Kaschock: if you could build an architecture together what would it move like? Where would you bury it and how would it grow? If “sleight” is a western “purity” and palmistry and eastern divinity what would happen if your characters held hands—an architecture of. **Actually, I deeply love and respect Roland Barthes and I don’t want him to go anywhere: a man who writes about jouissance just lends his spirit to play. Kirsten Kaschock’s new book Sleight, just out from Coffee House Press (Oct 2011), is popping up in WordPress blogs daily. Bombay Gin will be featuring a review of the text this year: and yes, I am on the Kaschock Groupie Kickoff Team. If you call yourself an experimental prose writer (or if others refer to you as such), then you need to be reading Kirsten Kaschock. If you call yourself an artist-mother-dancer-writer-poet-philosopher-humanbeing being, then you need to be reading Kaschock. A sleight is not a dance. A sleight is not a poem. A sleight is not a piece of art. A sleight is not a sister. A sleight is not a mathematical equation. A sleight is not a drawing. A sleight is all and none of these—negative capability. In the presence of these intersecting forms an architecture is built out of erasure: absence is Need and presence is Desire—one can buy and hold a Soul. One can disappear: to wick. Kaschock, a dancer-writer-artist-philosopher-mother, grants permission to her body, her body of work; she lays down for us. For the complete review, please read our publication this year! When I first rolled in to Boulder, CO last June to start my MFA at Naropa University, I stuck my head out the car window, inhaled an air that did NOT smell like mussel shells and marsh bottoms, and thought: Holy goodness those are some big mountains! Yes, I thought the Flat Irons were the “Rockies.” I had no idea what was behind these rolling foothills. I am from sea level; I am from the sea—and if I were in water and looking up, they’d be some pretty big waves. After a camping trip and hike (NOT to the keyhole) at Longs Peak, I began to see and feel the difference. How is vertical ascension—altitude—a threshold of contour? In the spirit of Naropa-ness, I will take this opportunity to be transparent. I also have no idea how to “blog.” Said it. It’s out there: in the foothills of blogging and calling it Rocky Mountain High—in the Great Lakes and calling it ocean (playful poke to my new Mid-West friends 😉 ). A deeply grateful thanks for Heather Goodrich and Katie Ingegneri for setting up the blog space and Jess Hagemann for being our first Bombay Gin blogger of Fall 2011. Our editorial board will take turns posting (a two week rotation); so, hang in there readers! The theme for issue 38.1 is Threshold. As previously noted by Jess, threshold is and is not the following: the thing you cross into/over, so as to discover what’s beyond/beneath/hiding in the liminal—the space of trans–the site of exchange–the wall, the ceiling, the carrying capacity of breath–the significance of space–the between place. Threshold is also the doorway, the window sill, the mouth, Hwy 119: how does printing to the page make the idea of threshold in all its elusiveness a very real architecture? 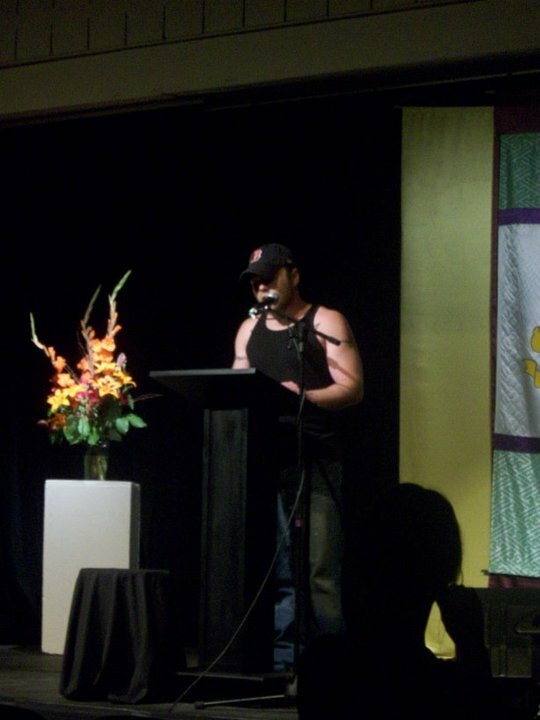 The 4X4 Reading Series hosted by Naropa University, Denver University, Colorado University, and Colorado State University gathers the Front Range writers in academic programs and chooses four. What are the thresholds that exist in a reading series? How do sequencing and order and friction and placement start to create a threshold of-to-for? On October 13th, the first reading in the series, Matt Wedlock (Naropa), Gabrielle Fuentes (CU), Derek Askey (CSU), and Meghan Dowling (DU) took the stage to read to us: 4th wall—another threshold—a scrim? Poetry, essay, short story, and prose became our companions and in this collection a thread became evident—the use of water. Wedlock’s water is salt; Fuentes’ water is ice; Askey’s water is glowing; Dowling’s water is the faucet: how is breaking water threshold—how is threshold conduit—how is bioregion liminal in the writer’s work? The Beats crossed and recrossed the country from coast to coast and Denver/the Rockies served as the node for the infinite figure eight loops. How is the heart of something—a country, a text, a person—entered? I want to learn the passage to a place with no water, the high desert: where does the flow come from, Continental Divide? The space between two companions—threshold—not when, but how will we arrive? Brush up on your Beats and join Bombay Gin at Naropa’s 4X4 Reading on October 13th at 7:30 PM in the Performing Arts Center (Arapahoe Campus). Bombay Gin will be giving away free issues to audience members who can answer trivia questions about our Rocky Mountain writing lineage. Naropa University, CU, CSU, and DU will showcase students from their writing departments. Naropa will be represented by Matt Wedlock. We look forward to seeing you tomorrow night! The fall issue of Bombay Gin will feature the marvelous work of one charmingly blunt Ana Bozicevic, Croatian-born poet and editor of the online journal esque <http://www.esquemag.com/&gt;. I got to know Ana when she was an invited workshop facilitator, along with her partner Amy King, at Naropa’s 2011 Summer Writing Program. The theme that week was cyborgian natures and the hybrid. In Ana’s class, we pieced together cyborg manifestos, crafted exquisite corpses, and culminated in the production of a group video depicting the simultaneous reading of twelve individual poems. What could the viewer piece together from that? Why, that ‘the human symphony is a cacophonous massage,’ no doubt–another of the provocative and lyrical statements that Ana spouts conversationally, as if to speak in poetry was the norm, and not the divine birthright of a few highly talented artist-writers. Check back soon for more previews of the fabulousness to come! You’ve never had a necklace like this. It occurs to me this morning that writing is like making jewelry. You hand-select each bead, studying it for flaws, before adding it to the string. So, too, you select each word, tasting it in your mouth, studying how its colors and rhythms contribute to the overall design of the necklace. Sometimes, you drop the strand you’re working on and the beads go flying and rolling all over the place, and you have to begin again. This is what happens when you accidentally delete an entire document from your hard drive. Writing is also like making jewelry because often, handmade jewelry is a gift. It’s made with care, with a certain recipient in mind, and presented in gift wrap/bubble wrap/boxes/bows. Writing is created with a particular audience in mind, and the way the word graces the page is its own decoration. Sometimes there are pictures, or paintings, or crazy things happening with the text. Two of my favorite examples: Mark Danielewski’s House of Leaves, http://en.wikipedia.org/wiki/House_of_Leaves, and Tom Phillips’ A Humument, http://humument.com/. I would totally wear these two like a favorite necklace. Feel free to do the same with Bombay Gin! ‘How to hide things’ is the general rubric of the investigative poetry collection I am currently working on. In this over-information age, where everything is accessible at the click of a button, how do we keep secrets anymore? Headlines belying gossip, gossip patching the gape in the back of the person we stab, the stabbing pain of feeling sometimes too accessible, as if the militant dystopia has come to be and we can’t kiss him, tell her, or do it without the whole world knowing, immediately. The good news: This is excellent for Bombay Gin! No longer must the underground poetry journal reside in the Teenage Mutant Ninja turtle sewers of obscurity. Join us in spreading the word about what will be an incredible fall issue; the ‘threshold’ between light and dark, fame and obscurity, the street-level and the sewer-dwelling. At least one really good movie about sewers comes to mind…Now and Then, about four twelve-year-old girls growing up in 1970. During a cold night’s freak rainstorm, one of the girls falls down a storm drain in the street and almost drowns. Teeny: Chrissy, truth or dare? Teeny: Have you ever been french kissed? Chrissy: Are you kidding? I don’t want to get pregnant! Funny, yes, but in 1970 there wasn’t the internet to disseminate useful information to young girls. People were liable to get confused in the absence of information, just as they are liable to get confused in the information overload. Bombay Gin. The literary journal of the Jack Kerouac School of Disembodied Poetics. Slated for release this winter. Featuring some kickass authors. Amen.